Hope everyone had a great half term. Time is flying by and we are now on the count down to Christmas! On Wednesday the 29th of October we were invited to a NESTA event held in the Houses of Parliament, London. We had a great time meeting lots of people who are all trying to make people aware of technology and where we can find it and some very creative ways showing us how we can use it. The pupils from Sir Thomas Picton attracted most people to us as they showed off their robot called “The Bird” which was the 2014 winning robot at the Technocamps robotics competition. After London, Playground Computing teamed up with Glynn Vivian and ran a spooky robotics workshop at the YMCA, Swansea on the 31st. We had great fun learning about binary, navigate each other through a maze, and working in groups and making a track for TechnoWallie to go around. On the 3rd of November we launched our NEW “How Computers Work” workshop which involved looking at how all the pieces of hardware found inside a computer link together and works. We also had great fun working out how we can send messages in binary using pingpong balls and what happens if our messages are ever changed or intercepted. It was a great start to the workshop with a few needed tweaks we are ready to roll with it! The 4th of November was an extremely busy day! TechnoWallie and I set off to spend the morning with year 6 at Cwmglas primary school as they got the chance to see TechnoWallie and gain a chance to understand what it’s like to program a robot. Then we made had to make a swift journey to Celtic Manor as we were part of the Digital Tuesday, we had lots of people showing great interested in Technocamps and were amazed by what we have achieved! 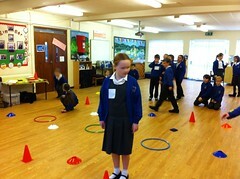 We headed back to Cwmglas on Wednesday the 5th to run robotic sessions for the year 5 and the other year 6 classes. They had a wonderful time and TechnoWallie really enjoyed the day! Yesterday we were in Pil Primary in Bridgend visiting year 5 and 6 who designed their own robots, had a go at “Fix the Factory” on the iPads and were introduced to some of the things TechnoWallie can do! This morning I was with year 6 at Glyncollen who got the chance to have a go at the new workshop and really enjoyed learning about different parts of the computer and see how everything connects together. TechnoWallie has a nice relaxing weekend before heading out to Severn Primary on Monday! ← And the first half term is over!